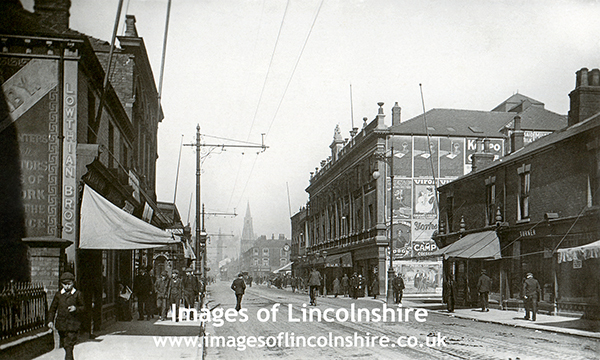 Another wonderful, vintage photo of an important Grimsby Street. In the far background is the Dock Tower. St Andrew's church is on the far right-hand side of the street. The fine-looking church was demolished in 1962. Why?? On the left, it says 'Lowthian Bros'. These were prolific portrait photographers of about this time. The majestic building on the right is 'Curry's'. I presume this was Curry's Prince of Wales Theatre rather than an early branch of the retailer of electrical appliances! The theatre was gone before WWII, I believe. Another fine building lost! There are a few clues as to the date the photo was taken. Perhaps you can help 'fine tune' this? The Rapid Photo Printing Co Ltd. is said to have been in business between 1901 and 1910. Amongst the many posters on the high wall of the theatre which are advertising coffee and remedies etc. is one that says 'The Prodigal Son by Hall Caine'. This was originally a book which was writen in 1904. A film based on the book was made in 1923 but I think the poster may relate to an earlier stage production. Did a play of the same same visit Curry's Prince of Wales Theatre between, say, 1905 and 1910?